If you can, kick start things with a trip to the podiatrist. Although a pedicure is a nice, pampering treat, it doesn't properly sort out any hard/cracked skin, tidy up nails, provide foot care advice, etc. like a podiatry appointment does. Although soaking your feet does take the natural oils out of your feet and isn't always recommended, I love a soothing foot soak every now and then. Soak your feet in warm water, epsom salts and a drop of your favourite essential oil for 15 minutes to relax and remove toxins. Pat your feet dry and exfoliate any hard areas with a pumice stone, then soak for a couple more minutes before a final towel dry, taking care to dry properly in between toes. Finally, spend a few minutes on each foot massaging in a nourishing foot cream/balm (preferably organic and natural). Moisturising will help keep dry skin at bay and using a massaging technique whilst applying it will help boost your circulation and soothe tired feet, almost like a mini reflexology session! Cut toenails straight across, never cut down the sides or at an angle, to avoid ingrown toenails. If you're a nail varnish lover why not ditch the toxin-laden high street versions which can dry and damage nails, and go for a brand like Nailberry which is free from formaldeyde, DBP and other such nasties? Wash, dry well and moisturise your feet every morning and night. I know this sounds a bit OTT but your feet work hard and they need some love too! 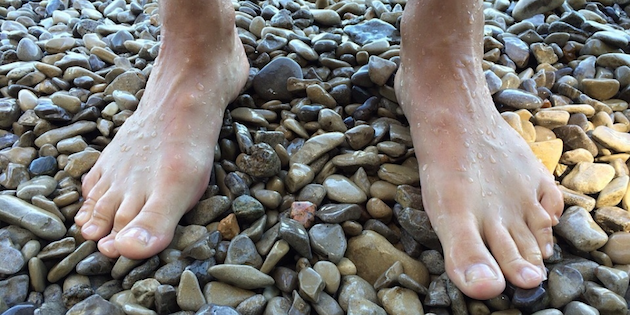 Keep on top of the dry skin on your feet by using a pumice stone or file. Don't go too mad – sore feet are never good – a weekly, two minute, gentle file in the shower should keep your feet nice and smooth. Gently exercise your feet to help your circulation and keep your joints mobile. One exercise suggested by the College of Podiatry is to circle the alphabet, with both feet, from A to Z. Easy to do while you're at your desk or watching the latest box set. Quite literally, put your feet up for 10 minutes at the end the day to help boost your circulation. I either put my legs up on the arm of the sofa or rest my feet on a bundle of pillows when in bed. Get a foot rub! Do it yourself, recruit a friend/family member/partner, or come for a reflexology treatment. Not only does a foot treatment improve the blood flow in your feet and legs, eliminate toxins and sooth nerve endings...it feels really good too! I love going barefoot whenever possible. It lets my skin breath, makes me feel more connected to my environment and my body (which is actually quite calming), and often gives my feet a mini massage in the process. Pebbly beaches are particularly good for that lovely 'ouch-ooh-aah!' reflexology sensation. Wearing good footwear is really important and there's probably a whole blogs-worth of info I could give you on this. The main thing to say is that when choosing any kind of footwear, from runners to going out shoes, make sure they are made of a breathable material, are cushioned, and have good arch support to help your feet, legs, knees, hips, back and overall posture. Flip flops are great but *square alert* they're generally pretty rubbish in terms of foot support. Don't get me wrong, I wear them but I also make sure that I don't over-rely on them in the summer and wear other shoes too. Alternating your footwear is a good idea anyway, to avoid pongy feet and infections such as athletes foot lingering in the warmer weather. Above all, your feet shouldn't hurt – ever, well not unless you've had a particuarly wild night out dancing til the wee hours. If your feet regularly hurt, something is wrong and a trip to a podiatrist is a good first step. I think I might have said this once or twice before but our feet work hard for us and we definitely need to look after them!